One of the great parts of the blogging community is the immense number of contests that are active. One blogger after another is either celebrating an anniversary, celebrating a success, clearing stock or just making an excuse for fun. I'm overdue for a contest, in fact. I completely missed my 6th year of running the blog. I'll figure something out. I enter them from time to time. Do I notice the post before sign up ends? Are the winnings items that fit my collection? How much energy to enter? I certainly don't enter them all - maybe 50% at best. So odds of winning are usually pretty low. But even a broken clock is right twice a day, and I pull out the impossible ever so often. Kerry over at Cards on Cards runs a couple NCAA contests a year - one for bowl time and the other for March Madness. Every time I enter, I tend to get out of the gate fast, then fall apart and end up in the middle of the pack. Well, this past NCAA basketball tourney, I was certain to end another year as the bride's bride's bride's bride's maid, and not the bride. And then the final was played, and some how the math went my way. The winning were a blaster of GQ and a blaster of Kerry's choice, which ended up as Archives. Some nice cardboard came from the Archives blaster, and maybe I'll actually finish building the set. Love that image on the Bench. And here's the Gypsy Queen blaster. 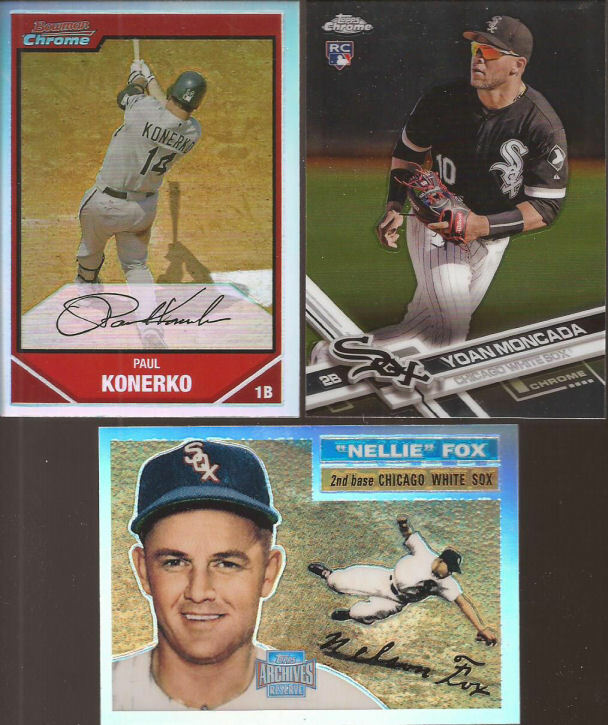 Nice SP with the Honus, and a logo swap Happ for the PC. Not sure why I scanned the Mengden. I think it was the similarity to it being a pic of Rollie. Kerry added some bonus cards to the mailer. We have color, with a sepia SC Thomas, blue Prizm and B&W Donruss Abreu. Some rookies. Hoping Carson figures this out. I think the Sox should turn him into a reliever. His starts are dreadful. 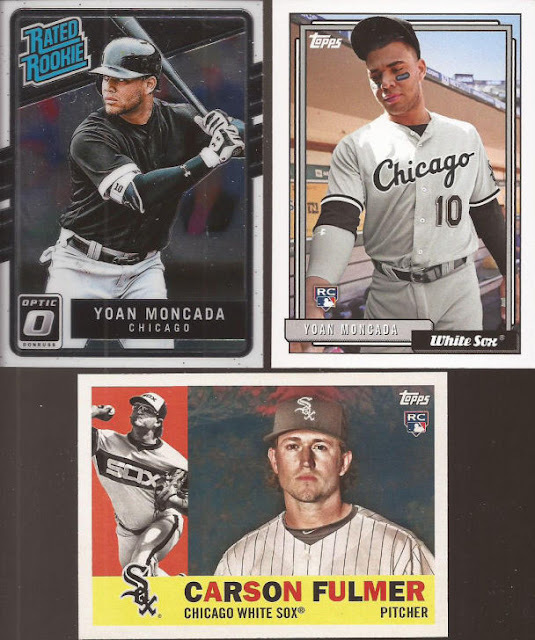 Couple for PCs, and a nice Chrome Moncada. Yoan isn't tearing it up, but he's still just 23, so no need to start freaking out. I think he is developing nicely and will fit in well at second for a few years. Last in the mailer was a dozen plus to help with the SC build. I didn't intend to scan the Correa and Bregman, but interesting how Topps selected similar images for the left side of the Astros infield. Thanks again, Kerry. The blogosphere's resident crazy man Wes from Jay Barker Fan Area 40 is having a year long (?) goodbye to the blog and running contest after contest. Unintentionally I entered and one the first one he ran and came out at the top of the randomizer. Some nice additions in the mailer with the die cut Big Hurt, a refractor of a Sox minor leaguer, and that sweet Drabeck Fleer numbered to 100. These were the contest winnings. 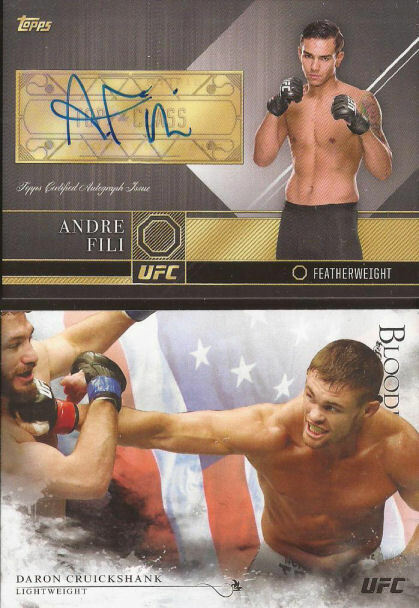 A nice auto of Andre Fili, currently 18-5 and scheduled to fight again next month. The lower card, Daron Cruickshank is number 9/148. He is 20-10 and currently with the Rizin Fighting Federation, but has not had a bout for almost 2 years. Thanks Wes. Reconsider leaving, would ya? I miss Prizm parallels, blue and tie-dye in particular. Oh I know Prizm can be found in Chronicles but I want MORE. UNOPENED boxes full of them! Happy belated blogiversary! And congratulations on the tournament win, those were some pretty cool prizes. Happy 6th! Love me some Smithereens! You scanned the Mengden because he's awesome. (Also, he shares a birthday with me. Happy (belated) 6-year blogging anniversary!